Carol II of Romania has created the first order in the world designed specifically for pilots - Virtutea Aeronautica. After renouncing the throne in 1925, Carol changes his mind and decides to force things and regain his crown in 1930. After secretly negociating with Iuliu Maniu, the top Romanian politician of that time, Carol Caraiman (Carol had to take an ordinary family name after resigning his throne and after being expelled from the Romanian royal family) rents a plane in Paris and, in June 6th 1930, Friday, flies back to Romania, taking off from the Le Bourget airport. The plane, a Gnome-Rhône Titan-engined Farman (probably, a F.190, main production version, powered by a Gnome-Rhône 5Ba engine), was piloted by the French pilot Lallouette. After flying over Germany, Austria and Hungary, the Farman enters Romania's airspace, but it reaches fuel limit and the plane has to land near Vadu Crisului village. After refueling his plane and receiving drinking water from a local peasant-woman, called Mudura (Modura), Carol's plane is descovered by a twin-seat IAR Potez 25 airplane, piloted by cpt. Ion Cristescu, sent by the commander of the 2nd Flight Reconaissance Group based at Someseni airfield (Cluj), worried about Carol's delay. As Carol's plane, the Farman has engine problems, Carol flies to Someseni in the Potez 25, where it lands at 19:00. At 19:25, Carol, in a Potez 25, piloted by cpt. Nicolae Opris, takes off and heads for Bucharest, escorted by 2 Potez 25. After an eventful day, Carol Caraiman lands at Baneasa Airfield in Bucharest, at 22:05, the same day. To express his gratitude for the help he had received to get back to Romania safely, Carol II created Virtutea Aeronautica Order in 1930 (Royal Decree no. 2895) and Medalia Aeronautica (Aeronautical Medal) in 1931 (Royal Decree no. 463), after 10 years, in 1940 (a few months before he was forced to abdicate), Carol II emits a set of anniversary coins (90% gold, 10% copper). 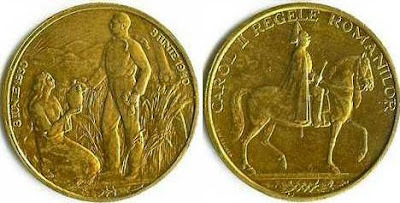 One of the anniversary coins illustrates the Vadu Crisului episode. On the coin, one can see Carol, on a wheat field, taking an earthenware pot from the peasant woman called Modura. Behind Carol, the propeller of an airplane, and, in the background, sunrays and hills. About June 6th 1930, there is an excellent article in Magazin istoric (History Magazine), January 2010, written by Mr. Dr. Valeriu Avram, called 'The aviation and the restoration'. Special thanks to Mr. Vici, at WorldWar2.ro Forum, for scanning the article for me!!! Support this blog in promoting Romanian Air Force's history, aviation and sim flying.